Posted on Wed, Feb 22, 2012 : 7:37 a.m.
A new blast of snow headed toward Ann Arbor could dump up to 5 inches on the area by Friday, the National Weather Service says. Ann Arbor-area residents will probably need to haul out the shovels Friday morning. 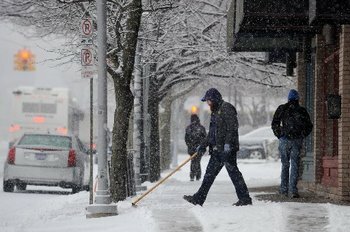 Here, a man shovels sidewalks along West Washington Street Tuesday morning. A low-pressure system moving across the Ohio Valley is expected to bring snow to the area Thursday night, said Amos Dodson, a meteorologist with the National Weather Service in White Lake Township. Accumulations Thursday night could range from 2 to 4 inches. The low is expected to drop to about 30. The chance of snow is 80 percent. More snow is likely on Friday with an additional accumulation of 1 to 2 inches possible. The day is also likely to bring some melting as the temperature climbs to around 37. Before we get to the snow, expect rain showers in the Ann Arbor area Wednesday morning and cloudy conditions in the afternoon. Temperatures will climb to around 40, but it will be breezy with winds gusting to 25 mph. Snow showers are possible Wednesday night with a low around 30. Before the serious snow hits Thursday night, there’s a chance of snow Thursday morning. It’s expected to turn to a rain and snow mix by 11 a.m. The temperature will climb to about 39. The chance of precipitation is 50 percent. For updated conditions and weather forecast's any time, check AnnArbor.com's weather page. Wed, Feb 22, 2012 : 9:35 p.m.
Good job annarbor.com, I guess all of us Doubting Thomas's will have to eat crow or snowy owl, or snow geese. But not yellow snow. Wed, Feb 22, 2012 : 9:33 p.m. Wed, Feb 22, 2012 : 9:27 p.m. The snow will come and the snow will go. Just like the other day. The snow came and it went with the rain. We should title this winter as &quot;As the Snow Blows&quot;. We had a great winter. Glad we are almost done. Wed, Feb 22, 2012 : 8:51 p.m.
@ Major, I don't know what sites or areas you checked but TWC has us listed under a severe winter weather alert for Thursday evening until Friday afternoon. Wed, Feb 22, 2012 : 8:44 p.m.
AnnArbor.com should be more cautious in &quot;beating the drum&quot; about weather. I just checked Weather.com, plus AnnArbor.com's own weather page, and neither shows any significant snow accumulations coming our way. Wed, Feb 22, 2012 : 8:43 p.m. Wed, Feb 22, 2012 : 6:16 p.m.
Yep, complainers and doubters about the predictions of the storm, and yet if the storm hits and accidents happen as a result, then the complaints will be about the road crews failure to keep the roads clear and warn the public about the coming snow storm. There are always complainers about something it seems. Wed, Feb 22, 2012 : 7:23 p.m. I guess that's why you are complaining about the complainers huh? Wed, Feb 22, 2012 : 6:09 p.m. Wed, Feb 22, 2012 : 9:05 p.m.
For the warm lovers, the more CO2 the better! Wed, Feb 22, 2012 : 5:35 p.m. Wed, Feb 22, 2012 : 6:18 p.m. Wed, Feb 22, 2012 : 5:14 p.m.
darn i was just starting to look at my golf clubs to see if they want to come out and play? Wed, Feb 22, 2012 : 4:33 p.m. Wed, Feb 22, 2012 : 3:59 p.m. Wed, Feb 22, 2012 : 3:12 p.m. Wed, Feb 22, 2012 : 2:54 p.m.
&quot;Ann Arbor-area residents will probably need to haul out the shovels Friday morning.&quot; And the city of AA might have to haul out their trucks. Oh, that's right, only if it snows more than the magic number of 4&quot;! Good luck drivers! The city will probably just wait until it melts. Wed, Feb 22, 2012 : 2:38 p.m. File this story under &quot;hype, business a usual&quot;!! Just checked 5 separate weather sites, locally NONE have ANY reports of ANY snow accumulations. Wed, Feb 22, 2012 : 10:10 p.m.
After I made this comment I thought to myself...hmmm A2.com my have more current info than what was available to me at that time...now they say 6&quot;...we will see!!! Wed, Feb 22, 2012 : 8:39 p.m.
Accuweather is reporting a projected accumulation. And they all agree there WILL be snow showers. With as little snow as we've had this year, 4 or 5 inches would be a big deal at this point. No need to get all ants in the pants. Wed, Feb 22, 2012 : 6:54 p.m. Wed, Feb 22, 2012 : 4:04 p.m. Wed, Feb 22, 2012 : 2:26 p.m. I've been really enjoying this mild winter. A little snow for the weekend doesn't bother me, as long as [a] I've got supplies and [b] nobody gets hurt driving. Be smart and careful, folks, and all will be well. Wed, Feb 22, 2012 : 2:15 p.m.
My gut says it mixes with rain at times and we only get a couple inches of slush at most. Wed, Feb 22, 2012 : 2:05 p.m. File this article under &quot;I'll believe it when I see it&quot;. Wed, Feb 22, 2012 : 1:50 p.m. Wed, Feb 22, 2012 : 1:15 p.m.
Well this should make the cross country skiers happy. I like the snow and don't mind driving in it. It brightens up the gray winter landscape too. I remember seeing snow in May here. Change is good. Wed, Feb 22, 2012 : 12:50 p.m.